In 2010, Goodwill Industries International launched the Donate Movement, a corporate social responsibility platform and public awareness movement that focuses on the positive impact donating has on the people and planet. Your donation of used goods can make a difference for people in your community, and help make a healthier planet as well. The Donate Movement, challenges all of us to donate conscientiously and responsibly. Goodwill knows the power donations can have on people and the planet. For nearly 110 years, Goodwill has been a pioneer of the "reduce, reuse, repurpose" practice. Together with our partners, we want you to know that your donated goods have the power to make a difference in people's lives, strengthen communities and create a healthier environment. When people think twice about what they donate, where they donate and how their donations affect others – and when they donate to Goodwill – that can have a powerful impact on our world. Goodwill has named this effort the "Donate Movement." Your donated goods have the power to make a difference in people's lives, strengthen communities and create a healthier environment. Visit www.1bagperhome.com to learn more about Donate Movement partners and to calculate the human impact of your Goodwill donations. Every day, the universal symbol for recycling reminds us to recycle bottles, paper, cans and more. Now, imagine another symbol on clothing, household goods and electronics that reminds you that an item can be donated when you no longer need it. 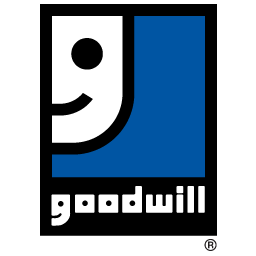 Goodwill's vision for the Donate icon is a universal reminder to 'recycle' through responsible donation, helping provide opportunities for others while diverting usable items from landfills.